Vitamin B12 deficiency symptoms are more common than we might realise. One of the main functions of vitamin B12 is promote nerve growth and nerve protection. A lack of it in our diets can result in mood swings and poor memory amongst other things. Things that we think are common everyday and that we assume as normal. Deficiency symptoms can take some time to become apparent, as the body is able to store up to 5 years worth of vitamin B12. The elderly and those with digestive disorders are most prone to a lack of B12 as the inability to absorb it is one of the causes. 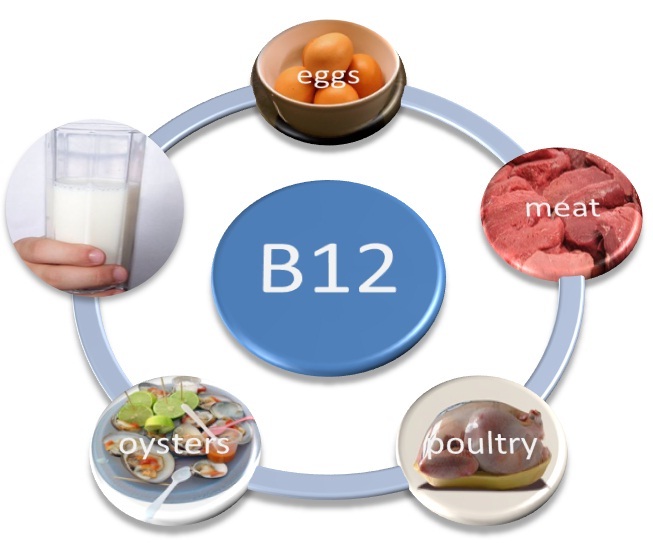 If vitamin B12 is not absorbed effectively and in sufficiency amounts, then this can lead to a deficiency. Therefore those with a digestive disorder could require some supplementation. Low stomach acid production and therefore antacids and medications which reduce stomach acid formation. These may cause vitamin B12 to not be absorbed into the system due to food in the digestive system not being broken down sufficiency. Other gastrointestinal complaints that might prevent the absorption of Vitamin B12 are sprue, Crohn's disease and some intestinal surgeries. Helps fat burning by using tissue carnitine to transport fats to be burnt for energy. Also important to heart health. Bone building is boosted by B12 as this vitamin helps the release of minerals and hormones needed to reduce osteoporosis. Needed for the formation of neurotransmitters and hormones such as adrenalin. These foods are almost exclusively obtained from animal produce. Although, soybean produce, some legumes and seaweeds have trace amounts and blue-green algae may be a good source.